Action footage from the 1960s and 1970s with original B-E soundtracks. 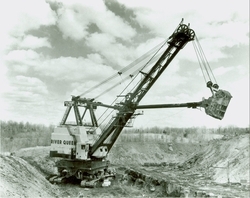 Featured from the mining industry are electric shovels, drills, draglines, bucket wheel excavators. Also construction shovels, cranes, draglines and backhoes. 2 hrs.